"For by Him all things were created that are in heaven and that are on earth, visible and invisible, whether thrones or dominions or principalities or powers. All things were created through Him and for Him." 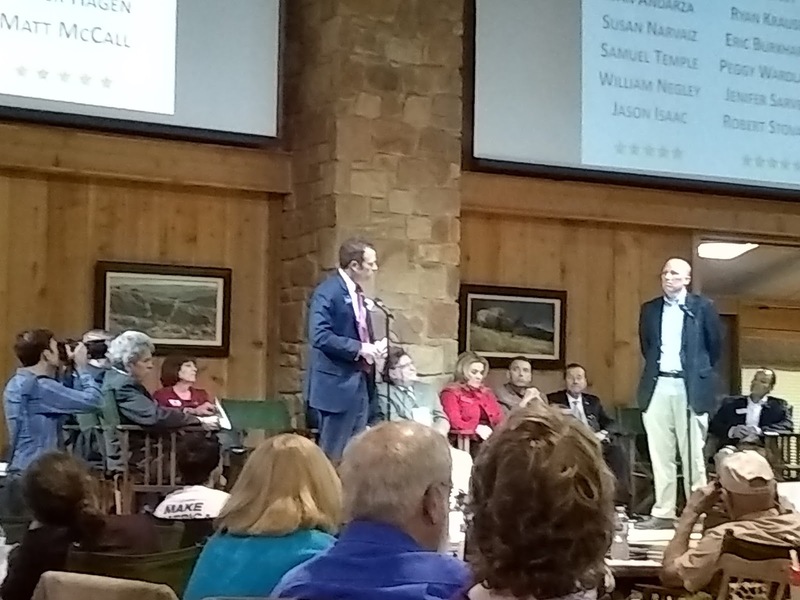 Last we, we wrote a blog post discussing the lack of creativity or intellectual bandwidth in the various races for open congressional seats across Texas; unfortunately, last night's candidate forum for the CD-21 race sponsored by the Travis and Hays County Republican parties was a textbook example of what we're talking about. The forum was loaded with boilerplate Republican rhetoric: "Founding Fathers," "Constitution," "Cut spending [without specifics]," "Reduce regulation [without specifics]," "Strong Christian," "Rebuild the Military," "Ronald Reagan," "Servant Leadership," "Drain the Swamp." Everybody hit their talking points. But we hope you'll forgive for saying that, after hearing them repeatedly over the past decade, those talking points have become rather stale. Instead, the candidates seem to be differentiating themselves based on resume and endorsements. If we're going to play the resume/endorsement game, Chip Roy will win. The man spent a decade in D.C., yet managed to escape with his soul and his integrity intact. As for the others, nobody stands out. Honestly, the most interesting candidate in this race is the worst one. Jen Sarver is a loathsome political hack (aka. Bush crony) who made a name for herself several years ago by the depths to which she was willing to stoop to carry water for the UT Politburo. What makes her interesting in this race, however, is that she's running as an unapologetic RINO. In a race where 15 candidates are attempting to cram into the "conservative" lane, Sarver has the "moderate" lane to herself. In a divided field in a district that includes Joe Straus' San Antonio stomping grounds, that might be enough to make the runoff. This website does not support Jen Sarver's candidacy in any way, shape, or form...but we are nevertheless VERY curious to see how she ends up doing. In terms of policy, the only candidate who (kinda, sorta) stood out was Matt McCall. Matt endorsed using Article 3, Section 1 of the constitution to remove abortion and marriage from the Supreme Court's jurisdiction. He also vaguely alluded to the need to abolish full cabinet departments. On the other hand, Matt also supports placing immigration related sanctions on Mexico, a move that would be DOOMED to backfiring spectacularly. We will also confess to a soft spot for Sam Temple, a longshot borderline-Anarchist who chided the other candidates for various stupid acts of fearmongring.